Saturday December 17th 1921 Had interesting talk with Mrs T J Patterson before leaving in a Taxi for Waverly. Went directly to Will Anderson. Mrs Lape came in afternoon. It rained quite hard. But I got to the station in a taxi and up to Matties the same way. very tired. Sunday December 18th 1921 I spent spare time writing. Wrote to Rob, Mollie Folsom, Tishie Hedges, and Sue & Sallie. Mattie and I to Vespers in PM. Monday December 19th 1921 I did a little washing. Mattie & I downtown. I went to the depot to see about trains. Had letter from Lorie. Downtown again. Tuesday December 20th 1921 I wrote to Lorie in the AM and was busy with other things for Mattie. We went down town soon after dinner. I called at Mrs Eskers and Mrs Tomlinsons. Evening at home. 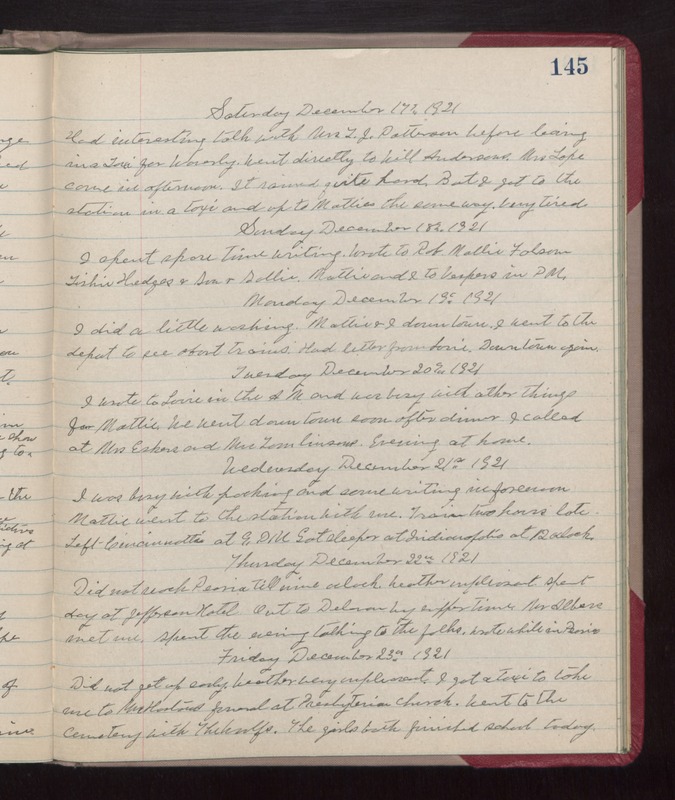 Wednesday December 21st 1921 I was busy with packing and some writing in forenoon. Mattie went to the station with me. Train two hours late. left Cincinnati at 9 PM. Got sleeper at Indianapolis at 12 oclock. Thursday December 22nd 1921 Did not reach Peoria till nine oclock, weather unpleasant. Spent day at Jefferson Hotel. Out to Delavan by supper time. Mr Albers met me. Spent the evening talking to the folks. Wrote while in Peoria. Friday December 23rd 1921 Did not get up early. Weather very unpleasant. I got a taxi to take me to Mrs Hortons funeral at Presbyterian church. Went to the cemetery with The Woolfs. The girls both finished school today.